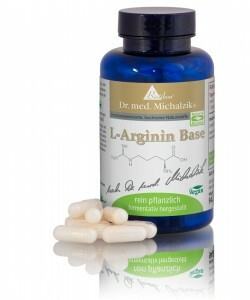 L-Arginine Base by Dr. med. Michalzik is of pure vegetable origin and is produced using a fermentation process. 3 x 1 capsule twice a day. Arginine Base by Dr. Michalzik is subject to strict examinations of German supervisory authorities. It is manufactured by use of gentle production technologies without heat or additives and without the use of processing agents which are not required to be mentioned on the packaging. For adults: Take 2 capsules twice a day one hour before eating, or 4 capsules before exercise, or before going to bed.